As many of you know, Upstate Craft Beer had a one year anniversary party last night. Extremely well attended (and I have the photos to prove it) and during the revelry while the band played on, I shot some video interviews, getting folks' predictions for the craft beer scene in 2017. 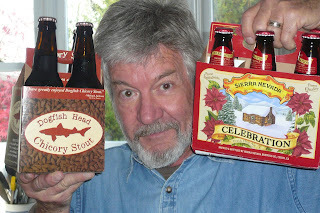 One of those is from my friend, fellow Cicerone Server and well know beer slinger, Harvin Bedenbaugh. Shelby Durham likes the community, even if it stretches to the next state! And now, for a musicians take on the brewing scene, and playing for them. George Colyer is one half of My Girl, My Whiskey, and Me. Good pickin, singin and tempos. Just when you thought it was safe, another interview comes along. At Upstate Craft Beer Co.'s First Anniversary party, the occasion for these videos, Jack Ryan McDonald offered his thoughts for 2017; partner/brewer Chris Hardin was busy busing tables! (I mentioned it was very well attended). We'll get him later. Here's a darn good read about IPA from an unusual source. Good for history buffs, tellers of tales and, of course, beer bloggers. Lengthy but you'll have earned a beer by the end. No quiz involved. So, among the many things 2016 brought us (so far), apparently Cookies & Beer Pairings have sprung up. 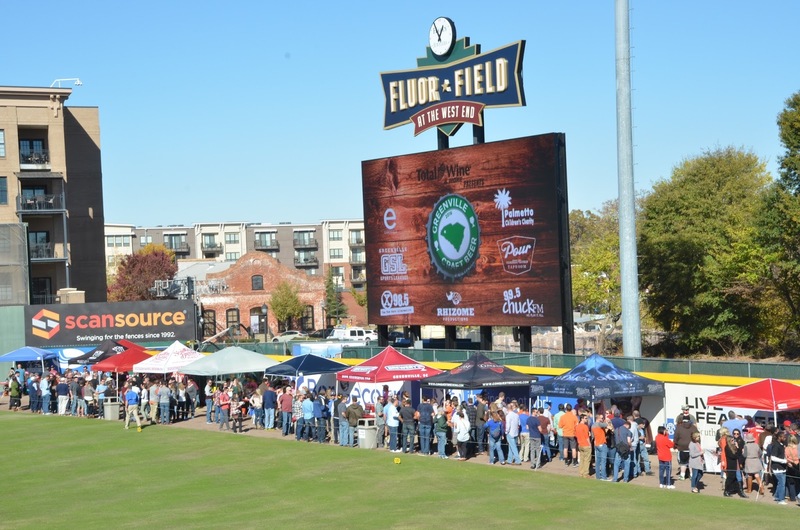 For example, two events just this week, one at The Southern Growl (possibly sold out) and another at Brewery 85. I'm thinking Milk Stouts could benefit from this pairing attention, but you'll have to attend to discover what pairs best. Now, my favorite cookie is a crisp peanut butter so DuClaw Sweet Baby Jesus comes to mind. You? Hey, you, pay attention, I have a couple questions! One, do you like Goose Island beers, despite their corporate ownership? Two, do you like traveling in Europe? Well, that's an easy one, and I found an equally easy way to enjoy both. Details in this link. Perhaps the best Black Friday idea yet. Support your local brewery! Good News for List Lovers! 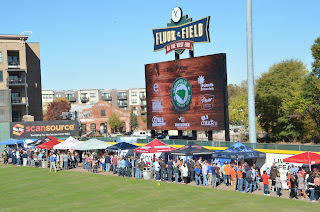 Meanwhile, editing pics from yesterday's Greenville Craft Beer Festival. 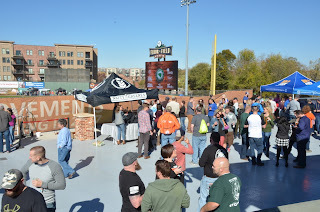 Despite some strong winds rattling the tent popups, and a few lines bottle necked on the warning track, this very popular event, nearly the last of the season, came off splendidly. Yep, Oskar Blues has a real winner in their Death by Coconut Irish Porter.. Not for those who dislike coconut, cause that's the flavor that hits the palate first. ABV not an issue, sit back and enjoy, very nice as a dessert. Well, surprise, surprise.... it came off as planned, announced to Leah Wong Ashburn, HBC President, that I had a bomber of 2015 Cold Mountain Winter Ale that had been overlooked in our beer fridge, was she willing to join me in a tasting? Of course she was up for it, and we are pleased to announce that the beer held up nicely, was very drinkable with the hazelnut/vanilla combination very evident. Lost a bit of carbonation, mellowed a bit with age, but still had the flavor characteristics that make this seasonal so desirable. Now, to wait for the official release of the 2016 version. Gonna be a taste fest!! Some photos to document to occasion: (Thanks to Jason Uhrinek for taking some of the photos) The Community Tap. Recover from last night's Hopoholic frenzy. Show up at 5:30 at The Community Tap for the Highland Brewing Company tasting. Remind Leah Wong Ashburn, President of HBC, that my first ever taste of Cold Mountain happened while interviewing her, back in 2014. This year's Cold Mountain has not been released yet (releases Nov 10) but I have a surprise for Leah. Highland has released several new beers so far this year and I anticipate most of them will be at the Tap for this tasting. Some photos from that interview, including my first glass of Cold Mountain. Ahhh, fond memories! 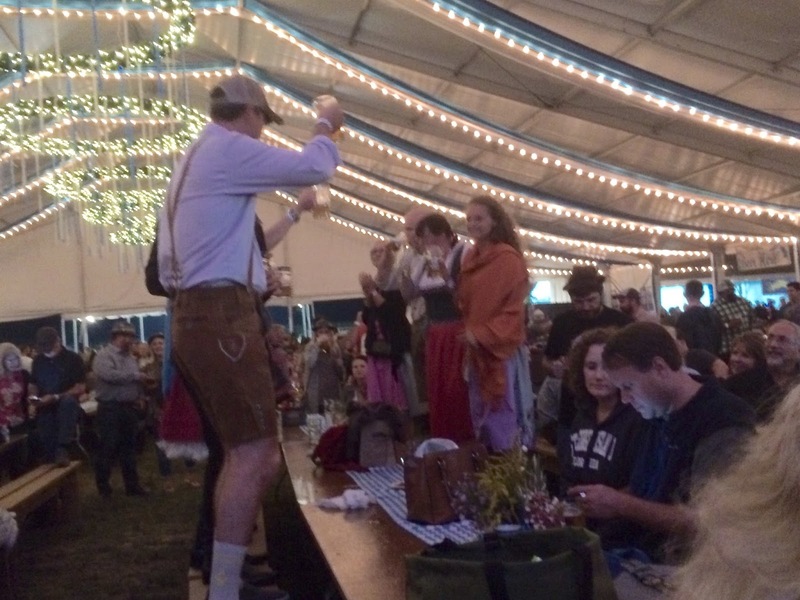 As I mentioned earlier, when it comes to Oktoberfest, Brewery 85 has one of the most popular fests around. Good beers, good food and guaranteed fun for all (ages). Today was no exception. Due to some poor time management (and some timely beer tasting) I got there a bit late, but people were still into the spirit of things. Some photos that capture a bit of the flavor of the day. With so many municipalities no longer supporting glass recycling, look for more and more breweries to add cans to their beer line up, if they aren't already. Was very pleased to be among the first group for the inaugural Birds Fly South Ale Project's brewery tour. If you are truly interested in how Shawn produces such consistently good farmhouse saisons and sour ales, then I suggest you join him on Saturdays, 3 or 5pm, and let him explain why all those barrels are necessary. Price of the tour includes the glass and all the beer it will hold. Win-win.